Hurry! You could win a book today! This is a friendly reminder of the BOOK GIVEAWAY I’m offering TODAY – November 12 – courtesy of Red Deer Press. Please refer to my October 22 post and read my review of A Hare in the Elephant’s Trunk – an amazing story written by Jan L. Coates. Then, following my October 28 interview with Jan, you have the opportunity to win a copy of A Hare in the Elephant’s Trunk by leaving a comment. Please be sure to let others know about this, too, and get the word out about this heralded novel. There’s not much time left until 9:00 pm (8:00 EST). Tweet about it, mention it on Facebook and in your own blog .. use your imagination to get the word out there! I know Jan will appreciate the publicity for Jacob and Wadeng Wings of Hope. Don’t know who Jacob is? Read my blog posts of October 22 and October 28. 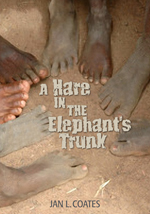 This entry was posted in Miscellanea, Reviews & Interviews and tagged A Hare in the Elephant's Trunk, book giveaway, Governor General Literary Award, Jan L. Coates, Lost Boys of Sudan, Novel, Red Deer Press, Wadeng Wings of Hope, win a book. Bookmark the permalink.